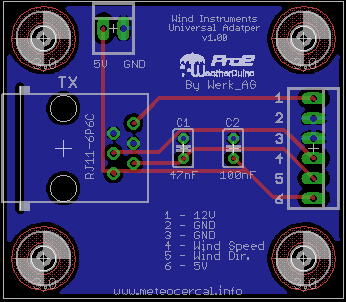 As we are adding software support for some new wind instruments, and some of them require a 5V power supply, I designed a new TX board, with some enhancements to allow a more easier connection of these new wind instruments. The wind RJ11 connector was changed to an RJ12 6P6C version, allowing the 5V to be present, in one of the pins. A pin with a 12V power, is also available in another pin of the RJ12 connector. The board includes now two SMD voltage regulators. An optional I2C bus extender chip (Philips) was added too. This allows driving I2C signals in cables up to 10 meters length. The transmitter module was also changed, now it uses the same module than the RX boards. An SMA connector to plug the RF antenna was also added. This makes assembly a lot easier. TX v3.11 board continues using a 7809 linear voltage regulator. In the past, it have raised some concerns amongst the users, related to its efficiency. It's true that the efficiency of a linear regulator is not comparable to a buck step down converter, but the consumption of the overall system is so low, that the loss of power is not very significant. The TX v3.11 board, with all the sensors connected, including a Solar / UV module and a powered anemometer*, consumes just 60mA, with very short spikes to 90mA, when it transmit data. This new board does not mean that the TX v2.50 board is outdated. In fact, it can be used to connect any of the newly supported wind instruments, including the ones which require a 5V power supply. Only a small modification is required: removing the variable resistor R8, and find a free connector with the 5V power pin available. 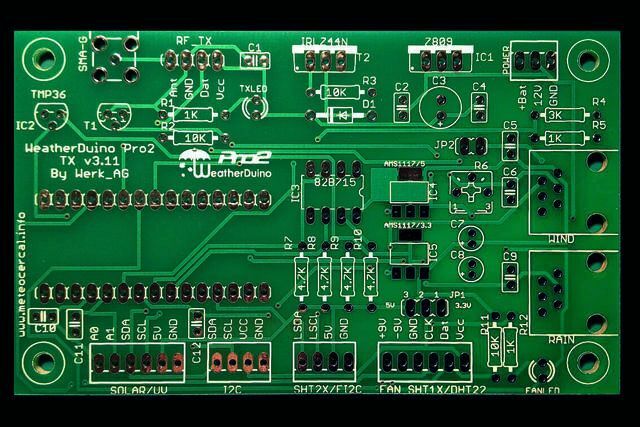 To allow an easy connection between any of the supported wind instruments, and the TX boards v2.50 and v3.1x, this small board, is available by request. As usual, I take backward compatibility very seriously. The 5V power connection is only needed for the TX v2.50 boards, the V3.11 boards will get the 5V, through the RJ12 connector. An important info that may be missing: For Fine Offset wind vanes, JP2 jumper should be closed. Keep JP2 open for all wind vanes based on a variable resistor. Info on previous post, applies to TX v3.12 too. Current time: 26-04-2019, 09:24 Powered By MyBB, © 2002-2019 MyBB Group.